The long-term partnership between MSC Cruises and Cirque du Soleil has seen the creation of the entertainment concept Cirque du Soleil at Sea and will result in a total of eight original shows that will be exclusively available on MSC Cruises’ four Meraviglia generation ships, coming into service between 2017 with MSC Meraviglia and 2020. Mr. Vago, Executive Chairman of MSC Cruises, had the vision to take the entertainment offered on board to the next level. Since MSC Cruises always seeks to work with innovative, world-class leaders, it was only natural that they would look to approach Cirque du Soleil. A first contact was made back in 2013, through Cirque du Soleil’s events and special projects division, 45 DEGREES. That led to a trip to Las Vegas with Mr. Vago, architect De Jorio, and other members from MSC Cruises to experience two of their shows. From there, a dream was born; MSC Cruises began to work with Cirque du Soleil’s 45 DEGREES’ team to create a purpose-built entertainment lounge and the first two Cirque du Soleil shows for MSC Meraviglia. Work began on the partnership in back in 2013 and the plans for the purpose-built Carousel Lounge were integrated in the ship design with construction beginning in 2015. In 2016 the creative process began and the concepts for the two shows were finalised. Cirque du Soleil’s 45 DEGREES’ team then recruited the cast and began workshops in Montreal. The performers and creative team moved on board whilst the ship was still at the shipyard in St Nazaire to finalise the shows in May earlier this year and rehearsed in the space, putting the finishing touches to the performances. The first show was then performed at the Christening in Le Havre on June 3rd. The Cirque du Soleil at Sea shows have been specially created for MSC Meraviglia and cannot be seen anywhere else in the world. For each ship there will be two very different, contrasting shows, each with a different concept, ambiance and storyline. Each show features an original soundtrack, staging and costumes. Work is already underway for the next two new shows for MSC Bellissima, which comes into service in 2019. All of the artists were carefully selected by Cirque du Soleil to meet the specific needs of the shows. Some of the artists had performed in other Cirque du Soleil shows whereas others were chosen specifically for the Cirque du Soleil at Sea shows. All of the artists were selected for special skills and trained to the high standards required of Cirque du Soleil performers., The Cirque du Soleil team needed to find artists that were multi-disciplinary, with a background in dancing and character work for most as the artists all would have to have a very strong presence on stage due to the intimate nature of the theatre. For the shows on the ship the artists needed to get used to performing at sea and we have worked on ensuring that the shows can be adapted to the sea conditions all the while ensuring that the audience experiences the same quality of show each night.. The shows are tightly choreographed but always have different scenarios so that if conditions are rough or an artist is injured, the performance can be adapted. Finding their “sea legs” has been easier on some then others! 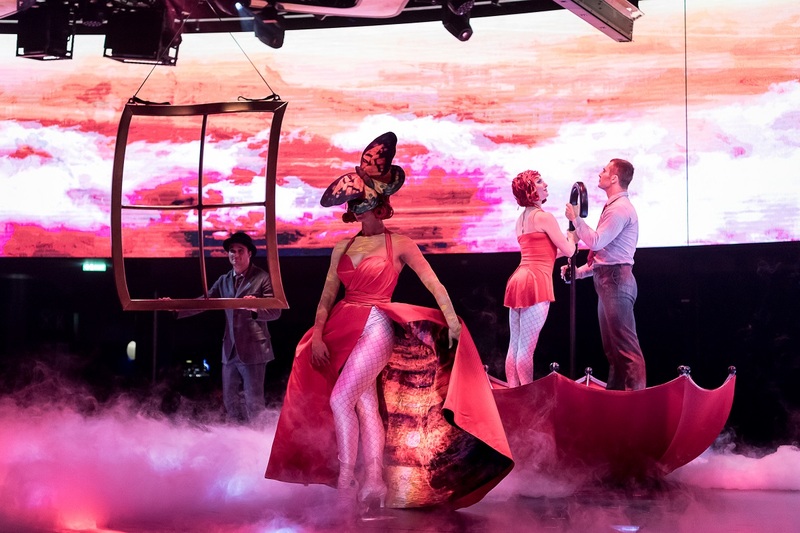 The Carousel Lounge is one of the most intimate venues that Cirque du Soleil has created a show for, challenging the Creative team to expand the boundaries of their imagination with this performance space. The ceiling height is a much lower than for a usual show, so one of the challenges was to look at different kinds of aerial acts and to incorporate new and fascinating visuals. The Carousel Lounge abounds technical elements: a 40 metre LED screen, a rotating stage, lifts, retractable staircase, to name a few, all elements that gave fuel to the creative team in dreaming the concepts of both shows. Some acts you can find in the shows: aerial hoop, silk, straps, roue Cyr juggling, cheerleading, dancing, acrobatic duets, ladder and a beat-boxer.